Between the Bars is a weblog platform for prisoners, through which the 1% of America which is behind bars can tell their stories. Since prisoners are routinely denied access to the Internet, we enable them to blog by scanning letters. We aim to provide a positive outlet for creativity, a tool to assist in the maintenance of social safety nets, an opportunity to forge connections between prisoners and non-prisoners, and a means to promote non-criminal identities and personal expression. We hope to improve prisoner’s lives, and help to reduce recidivism. Generally, the report makes the case that the study of criminal justice requires extensive study of sociology, and that the norms of sociology programs are key. “What the report signals is that sociology is worried about losing intellectual jurisdiction over this very important and popular area,” said Chris Uggen, a criminologist who is chair of sociology at the University of Minnesota-Twin Cities (and who was not on the ASA panel that produced the report). Leaders of that group view the sociologists’ report as a bit controlling and insulting (one called it “a sour grapes report”) and are preparing a statement of their own to counter the sociologists’ report. The criminal justice professors deride the sociologists’ report as being less about teaching and research and more about cash — in that many college administrators are favoring criminal justice these days, because of the enrollments it provides. “I think the heart of the matter is that criminal justice is attracting large numbers of students and sociology programs by and large are not,” said Jay Albanese, a professor of criminal justice at Virginia Commonwealth University who has been involved in preparing the response to the sociologists. He said that sociologists have no more right to suggest what the curriculum should be in criminal justice programs than they do in a range of other fields, such as nursing and social work, that also require knowledge of society but that have their own research and teaching methods. via News: Sociology vs. Criminology – Inside Higher Ed. Innovating the 21st-Century University: It’s Time! Professors who want to remain relevant will have to abandon the traditional lecture and start listening to and conversing with students — shifting from a broadcast style to an interactive one. In doing so, they can free themselves to be curators of learning — encouraging students to collaborate among themselves and with others outside the university. Professors should encourage students to discover for themselves and to engage in critical thinking instead of simply memorizing the professor’s store of information. Finally, professors need to tailor the style of education to their students&apos; individual learning styles. The Internet and the new digital platforms for learning are critical to all of this, especially given the high student-faculty ratio in many universities. But most faculty do not have the resources to develop the required courseware. This must be co-innovated globally through new partnerships. via Innovating the 21st-Century University: It’s Time! EDUCAUSE Review | EDUCAUSE. On Thursday, Dec. 10, OSTP will launch a public consultation on Public Access Policy. The Administration is seeking public input on access to publicly-funded research results, such as those that appear in academic and scholarly journal articles. Currently, the National Institutes of Health require that research funded by its grants be made available to the public online at no charge within 12 months of publication. The Administration is seeking views as to whether this policy should be extended to other science agencies and, if so, how it should be implemented. * Implementation (Dec. 10 to 20): Which Federal agencies are good candidates to adopt Public Access policies? What variables (field of science, proportion of research funded by public or private entities, etc.) should affect how public access is implemented at various agencies, including the maximum length of time between publication and public release? * Features and Technology (Dec. 21 to Dec 31): In what format should the data be submitted in order to make it easy to search and retrieve information, and to make it easy for others to link to it? Are there existing digital standards for archiving and interoperability to maximize public benefit? How are these anticipated to change. * Management (Jan. 1 to Jan. 7): What are the best mechanisms to ensure compliance? What would be the best metrics of success? What are the best examples of usability in the private sector (both domestic and international)? Should those who access papers be given the opportunity to comment or provide feedback? via OSTP to Launch Public Forum to Discuss Options for Improving Public Access to Results of Federally Funded Research « OSTP Blog. OpenJurist | Making the laws of the land accessible to the people of the land. OpenJurist’s mission is to provide access to published court opinions without charge. Our collection includes approximately 647,000 opinions from the United States Supreme Court published in the United States Reports, and from the lower federal courts, particularly the United States Courts of Appeals, as published in the First, Second and Third series of Federal Reporter. via OpenJurist | Making the laws of the land accessible to the people of the land..
Stephen Hicks, a reader in health and social care at the University of Salford, has just uploaded nine of his journal articles to his university’s online open-access repository of institutional papers, and has another ten in the pipeline. Doing so had not crossed his mind before, and it won’t be compulsory until January 2010 (last month, Salford mandated so-called “self-archiving”, becoming the 100th organisation worldwide to do so). But he was turned on to the idea after hearing Martin Hall, Salford’s vice-chancellor and an open-access advocate, speak. Hicks didn’t make his decision for altruistic reasons or because Hall said it could increase his citations and impact. Rather, he chose to make the papers available because he receives a barrage of requests from other academics for access. Directing them to the repository seemed a logical way to save time and make his life easier. Uploading is straightforward, Hicks says, estimating that it takes about ten minutes per paper. He simply fills in an online form with the details of the peer-reviewed article and sends it, along with the final accepted version, to the repository. Staff there pick up the ball, working out whether the copyright policy of the journal that originally published the paper will allow it to be uploaded. “You don’t have to worry about copyright because the repository staff do that,” Hicks notes, while expressing disappointment that some of his articles haven’t gone online because the journals do not grant permission. via Times Higher Education – Learning to share. David A. Harris, What Criminal Law and Procedure Can Learn from Criminology, 7 Ohio St. J. Crim. L. 1 (2009). Richard A. Leo and Jon B. Gould, Studying Wrongful Convictions: Learning From Social Science, 7 Ohio St. J. Crim. L. 7 (2009). Erik Luna, Criminal Justice and the Public Imagination, 7 Ohio St. J. Crim. L. 71 (2009). David A. Harris, How Accountability-Based Policing Can Reinforce—Or Replace—The Fourth Amendment Exclusionary Rule, 7 Ohio St. J. Crim. L. 149 (2009). via Moritz College of Law – Ohio State Journal of Criminal Law (Issues). Illicit file sharing isn’t just for kids these days. Once mainly used for downloading pirated music, sites have sprung up on the Internet that allow free swapping of academic journals (think Napster’s younger dweeby brother). A new study, published in the Internet Journal of Medical Informatics, looks at a site aimed specifically at medical professionals and students and finds that thousands of people were obtaining non-open-access materials free of charge. The article says that in a six-month period of watching the unnamed site, nearly 5,500 articles were exchanged, costing journals about $700,000 in that time, or about $1.4-million a year. The site had 127,626 registered users, who during the study period put in requests for 6,587 journals. There was an 83 percent success rate in finding the article. 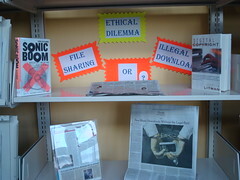 via The Wired Campus – The Latest File-Sharing Piracy: Academic Journals – The Chronicle of Higher Education. Critical criminology is the criminology of late modernity. Its inception was in the late sixties and early seventies at the cusp of change, its inspiration a world where oppressive relationships of class, age, gender and ethnicity became highlighted and evident (in that historical order)and where the pluralism, ambiguity and shift of values heralded a society where migration and human creativity created a diversity of cultures in close propinquity and interaction. In Britain the key academic organisation which provided a theatre for such debates was the National Deviancy Conference (NDC). Here, as Stan Cohen astutely noted, “well before Foucault and a long way from the Left Bank – our little corner of the human sciences was seized by a deconstructionist impulse” (1998, p.101). Indeed the NDC was pivoted around deconstruction and anti-essentialism. It dwelt on the social construction of gender, sexual proclivity, crime, suicide, drugs and mental states whilst fiercely criticising the major discourses of modernity, positivism and classicism, and its institutions, whether it was the prison or the clinic. The NDC was anarchistic and antinomian, set deep in the counterculture of the time. My own involvement in it was initially reluctant to say the least. It was a time when we regarded people with 9 to 5 jobs as complete failures, lived in communes and regarded the “straight” world with complete disdain. I was living in Notting Hill where Pink Floyd played weekly at the local parish hall, Jimi Hendrix was at Middle Earth and there was poetry in the streets. Academic conferences were not exactly where it was at. I was persuaded to go to the first NDC in York in 1968. I remember Mike Brake – later to be well known for his books on youth culture (1980, 1985) saying to me the evening we arrived, “What are we doing here, man? Let’s get out quick and get to Leeds where there’s much better clubs.” We stayed all the same and next day I gave my first academic paper, ‘The Role of Police as Amplifiers of Deviancy, Negotiators of Reality and Translators of Fantasy’ (1971a). A pretentious title but it still captures for me a constant theme of the way in which powerful forces in society create demons out of illusions which then, through stigma and oppression, take on a reality of their own. via CRITICAL CRIMINOLOGY IN EUROPE:. This action plan reviews both federal and state barriers to identifying and serving children of incarcerated parents, and offers policy recommendations for the U.S. Congress and the Administration. The action plan is designed to help federal leaders improve policies for children of incarcerated parents, but also includes recommendations of value to states and local governments that can facilitate and complement federal initiatives and result in better responses to this population. via Children of Incarcerated Parents: An Action Plan for Federal Policymakers.